A Very Fine French 19th Century Louis XV Style Tulipwood and Mahogany Marquetry Gilt-Bronze Mounted Petit-Bureau de Dame (Secretary). 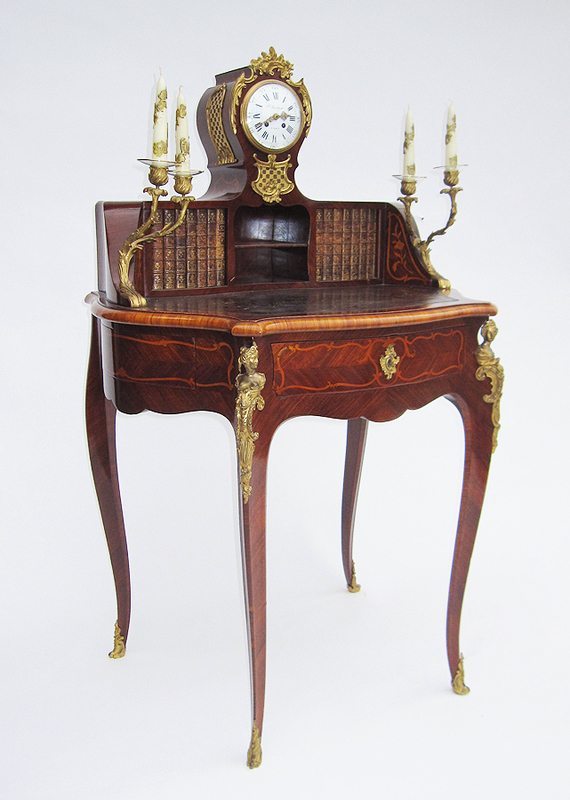 The bombé structure surmounted by a pair of gilt-bronze twin candelabra centerd with a clock, the porcelain face signed F. Berthoud, Paris; Below two "leather-bookends" sliding doors, a leather top and a front drawer flanked on each corner with a gilt-bronze Espagnolette maiden, on each side with a concealled pull-out drawer. This bureau de Dame includes a French 19th Century Louis XV Style Gildwood Carved and Cane Side-Chair. Circa: Paris, 1890.